"World's Cheapest Computer is Ready to launch by Indian Government within next week"
The long awaited $35 (Rs 1735) dream tablet promised by the Indian government will finally see the light of the day as the launch date has been fixed for October 5. The low cost computing device touted to be the cheapest in the world, has been a project drawn on lines similar to the OLPC, with the students being the target beneficiaries. HRD Minister Kapil Sibal said at a function, "The computer will be launched next month. This is not just a dream, it is a reality". While he said that the name for the device has been finalised and will be announced at the time of the launch, he declined to elaborate further. He stated that this computer will prove to be a very useful tool for students because it can do everything expected of a computer with internet connectivity. "Sibal said that the tablet has been developed through public-private association. It would be quite interesting to see how the new device boosts the learning abilities of children. We’re quite optimistic about adoption of the new tablet. However, it’s quite amusing to know why all Indian MPs were given iPad 2 for personal use by Indian Government. What do you think?" “Soon, a $35 computer will be made available to every child in school. 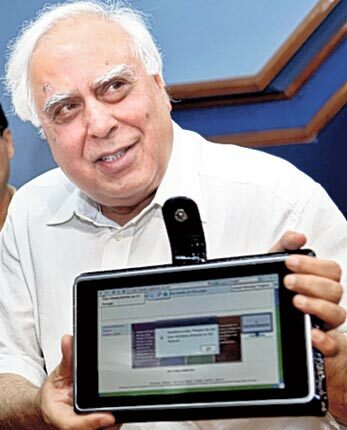 The tablet shall help enhance the quality of learning of children,” said Sibal. Sibal had unveiled the prototype of this device in July last year. It is expected to have a 5 \ 7 \ 9 " touch screen with an internet browser, PDF reader, video conferencing facilities, Open Office, Sci-lab, media player, remote device management capability, multimedia input-output options, and multiple format file viewer. The actual specifications still remain under the covers and will be revealed only when it is actually launched. However, it was reported not long back on this website that the name of the tablet is Sakshat and its specs were also revealed along with the news that it will be launched in June, which never happened. We don't have any reason to believe that it is not the same tablet that is going to be launched on October 5. The HR ministry has stated that the device will be launched with a considerably low $35 (Rs 1735) price tag at the start, which will eventually be slashed to $20 (Rs 990), and finally to $10 (Rs 495) over a period of time. Let's hope that the government delivers something real on October 5.
that almost all give credit score intended for. Heres my speculation, they saved features from the original game to attract more buyers to the content. magnificent publish, very informative. I'm wondering why the opposite experts of this sector don't notice this.